Four years ago, they feared each other. Today, the same Lewiston and Maranacook students hope their project goes national. LEWISTON — Four years ago, more than a dozen Maranacook Community High School students sat on their bus in the Lewiston High School parking lot and stared anxiously at the school. They were all freshmen, most of them raised in Readfield or another small, rural, almost-all-white town. With just 400 students in their school, everyone knew everyone. Lewiston High School seemed scary. “I thought it was kind of like more dangerous because there were more people and it was in an urban area, so I thought it would be more dangerous,” Anna Swimm said. Before the trip, one of the Maranacook students joked about getting stabbed. Four years ago, more than a dozen Lewiston High School students grew anxious as they prepared to visit Maranacook Community High School. They were all freshmen, many of them black, or Muslim, or immigrants. Some were all three. They were used to their big, diverse city school – nearly 1,500 kids, and more than a third were members of a minority. Maranacook Community High School seemed scary. “I thought they’d be racist,” Hussein Hassan said. Today, those fears are gone – on both sides. “They’re just like us,” Hassan said. 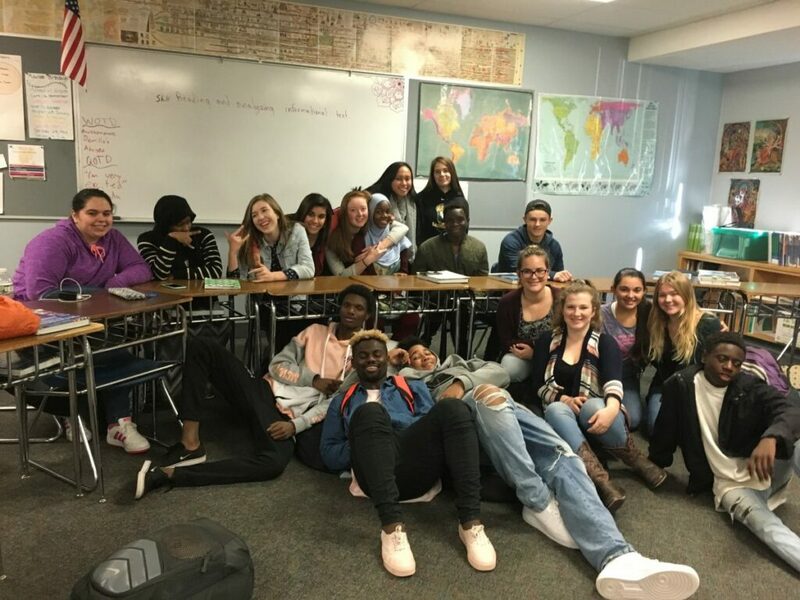 For the past four years, the two groups of high school students have been the first participants in a pilot project, spearheaded by nonprofit Operation Breaking Stereotypes, that encourages Maine students from different backgrounds to get to know one another. The goal: disprove the myths and unfounded assumptions each side has about the other. Most of the students in the pilot project are now seniors who have spent their full high school careers interacting with their counterparts at the other school. They’ve shared sleepovers and meals, long talks and joint projects, team-building games and school days. With the bulk of the group due to graduate in a couple of months, the project will soon come to an end. But the teenagers believe their four-year venture will have lasting results – not just for them, they hope, but potentially for all of Maine. “The Somali refugees in particular came here around 2001,” said Claire Frohmberg, a Maranacook senior. “So since I’ve been alive, they’ve been here. So what makes me more of a Mainer? “Why are we still kind of dealing with these issues of race and prejudice in our state 18 years later? It’s been nearly two decades and we still have to have these conversations about, ‘Just because she wears a hijab, she’s still human.’ Just because she wears a hijab, she’s still a Mainer,” she said. Connie Carter and her daughter, Camden, started the precursor to Operation Breaking Stereotypes in the spring of 2001. They were both high school teachers at the time – Carter in Orono, her daughter in the Bronx borough of New York City – and they thought it might be interesting for their very different students to meet. For years, Operation Breaking Stereotypes paired groups of Maine and New York students. Lewiston High School was among the first to get involved. Then Carter realized they didn’t have to go as far as New York. Mainers had stereotypes about other Mainers. She also wanted to make the connection last longer. Kids flowed in and out of most of the Maine-New York groups, but she’d kept one group together for four years. She thought that could work well with two Maine schools. Sticking together for four years – all through high school – could help them embrace not only similarities but also their differences. “They have different family traditions or different ways they view the world or their backgrounds are totally different. That seeds who they are. For that to happen, they need to be together for more than a year,” Carter said. So in 2014, Operation Breaking Stereotypes chose two high schools for its first intra-Maine exchange: Lewiston and Maranacook. They were only 30 miles apart, but the schools couldn’t have been more different. Lewiston is large and urban, filled with students who speak different languages, practice different religions and come from a variety of countries. Maranacook is small and rural, filled almost exclusively with white students whose families have lived in the area for years, if not generations. Students applied to take part in the project. Each school chose 15. Students also had to be willing to stick with the group for four years. Although they could quit if they needed to – families move, personal issues pop up, other classes require more attention – they were 14-year-olds largely committing themselves to something that would last through age 18. Some applied because it sounded like a cool way to meet new people. Others had a different reason. Each group gathered separately at first to ensure everyone would be comfortable within their own school group. Students then wrote personal essays that would be used to match them with a partner from the other school. The students were excited to meet but also nervous. Lewiston students thought Maranacook was a rich school filled with white kids who might be racist. Maranacook students thought Lewiston High was a violent school filled with students who might be offended if the Maranacook group mispronounced their names. Those assumptions quickly fell away once they met. The students met in groups and one on one with their partners. While everyone got along, not every partnership was a perfect match. An athlete and a gamer found themselves paired together. A quiet student and a boisterous student were partnered. Then there were the partnerships that simply clicked. Over the next four years, Lewiston and Maranacook students got together once each quarter for group projects or team-building exercises or just to talk. As families moved away or priorities shifted, some students left and new ones joined, but the core group remained the same and so did their goal: Get to know each other beyond the stereotypes. Soon, they were learning more than their partners’ superficial likes and dislikes. The students also learned that they had differences, and that was OK.
“We are one big family and a lot of kids say that: ‘I feel like this is my family.’ But as we all know within families, we aren’t all the same, either,” Carter said. The teenagers began connecting on their own online or at school sporting events. Once, two Lewiston students showed up at a Maranacook student’s lacrosse game. Last year, when most of them were juniors, the students stayed overnight at their partners’ homes. The sleepovers were initially as nerve-wracking as their first meeting had been. Many of them ended up spending their sleepovers doing the same thing: eating ice cream, watching movies and talking. This year will be their last together as a full group. Most of the students will graduate in a couple of months and then, next fall, head off to college. As a final project, they are creating a five-episode podcast in which they talk about their four years together. The first episode of the podcast is expected to be released this coming week on SoundCloud. Operation Breaking Stereotypes will post a direct link on its website and Facebook page. The students say they’ve learned a lot from the project: People are more welcoming and less scary than you might expect. Two people can look different but have things in common. Stereotypes can be dispelled by asking questions. Carter would like to do this project again with Lewiston and Maranacook high schools, if not with other Maine schools. Students said they’d like to see that happen. They think whole communities could benefit. They hope their project can be the start.